24 hours ago, the Jim Clark Rally on-line petition had over 1,000 signatures, now it has over 1,500, please keep them coming and continue to spread the word. 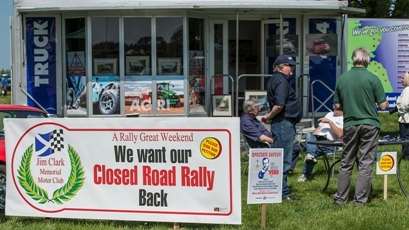 In addition to the on-line petition, club members have been attending shows and exhibitions throughout the Scottish Borders with petition forms for local folk and visitors to sign and this campaign is ongoing too. The encouragement, enthusiasm and the huge numbers showing interest are providing a great boost to the organising team. 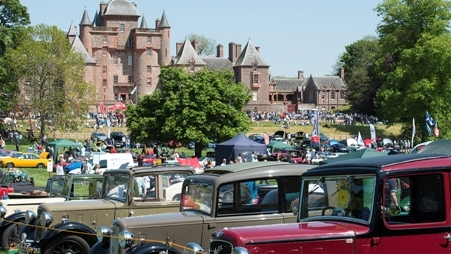 Most recently, the rally had a presence at the Borders Vintage Automobile Club show at Thirlstane Castle and there was a steady procession of willing and eager signer-upperers. This weekend members of the team will be at the Border Union Show at Springwood Park on Friday 29th and Saturday 30th having been offered space on the Border Ecosse Car Club stand, for which thanks are due to Tommy Heard. 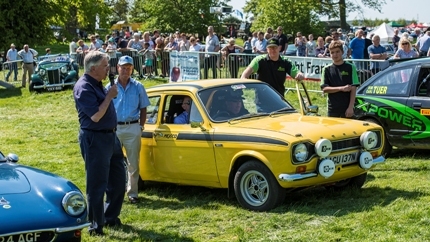 The following weekend is the Berwickshire County Show at Duns on Saturday 6th August and the club members are intending to have a presence there too. And it's not just fans and local folks signing up, superstars too (see pic) - that is my description, not his! 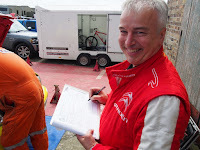 And finally, many thanks to all who took the time out to sign and to share. Keep up the good work.